The pork Martini serves many needs on many levels! In these pomo days, when old formulas are reborn with futile twists for our fickle tastes, the meat cocktail stands out above cranberry-tainted attempts at bar trendiness. 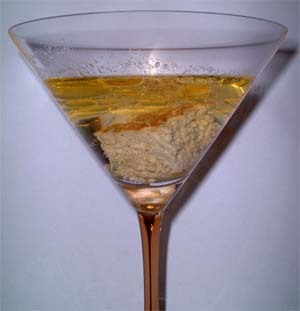 This Martini, abandoning the olive garnish for that of a pork-rind wedge, bridges social strata by merging the flavors of the working class with that of wealthier ones. It has the humanitarian goal of bettering the nutrition of alcoholics, offering protein for those who prefer their lunches liquid: since meat digests longer, it will both inebriate and offer nutrients for longer periods! It will open new markets to pork consumption, adding American jobs to every level of the meat-industrial complex. And, finally, it looks really weird. were steeped separately in approximately four ounces each of 100-proof Absolut vodka, in covered glasses, for up to two weeks. The pork patty and Spam were first sauteed in canola oil, which was tipped away early to avoid influencing the taste of the meats. The dried pork, being the least permeable, was given a few extra days to infuse. 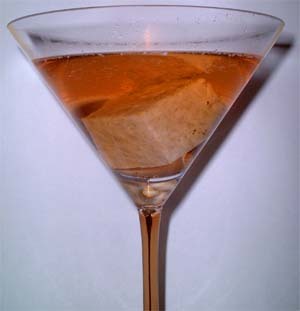 Although gin makes the only true Martini, vodka was chosen as the less distracting base for these cocktails, especially for the sake of the sausage Martini, the fennel and cracked pepper of which might clash with the complex botanicals of gin. After two weeks or more of stewing in Absolut, all four pork products showed minor physical changes. The Chinese sweet dried pork had been lightly pink and rough to the touch. After infusion, the meat was pale gray and the surface velvety soft, although the pork strips retained their stiffness. The vodka was murky with particulates. What first appeared to be traces of oil on the surface turned out to be aggregates of those pork particles. Its bouquet was simply that of vodka. The ground pork, which had never been very pretty to begin with, reminded me of some tumors I had seen at the Army Medical Museum at Walter Reed. Its vodka was the clearest of all. However, brownish-yellow droplets of pork oil clung to the surface at the rim. Its bouquet was distinctly meaty, with a slightly burnt overtone. The sausage retained its cooked gray color but its surface appeared muddied, softened. The sausage's fat chunks remained distinctly white. This vodka was tinged yellow. The bouquet smelled clearly of sausage, though it was less overpowering than that of the ground pork vodka. The Spam had changed the most dramatically in its alcohol bath. Its bright pink meat was now as dull a gray as any of the other porks, and its vodka was heavily clouded, yet quite bright with the finest of particulates. Oil droplets obscured the entire surface of the vodka. The bouquet reeked of acid. I asked a science-editor friend about the color change, wondering if the alcohol was reacting with the nitrite preservative of the meat, wondering if it would kill me. He rejected that possibility, at least the first half of it, in favor of the hypothesis that it was the pork that was leaching oxygen from the water in the alcohol. This was far scarier, but much more interesting, and if it had the side effect of increasing the strength of the drink, so much the better. The pork-infused vodkas were decanted from their glasses through a triple layer of cheesecloth into mixing glasses. This removed most pork solids, but no attempt was made to skim any oils present. The vodkas were separately mixed 1:5 dry with Martini & Rossi extra-dry vermouth, and were chilled only moderately so as not to disguise subtle flavorings. The Martinis were stirred, strained of their ice, then poured into fresh Martini glasses. Were any animals were harmed during the course of this experiment? Of course! The pork animals! Tasting was overseen by a collection of sprightly, generic-yet-authentic Cole Porter oldies such as "Let's Do It," "I've Got You Under My Skin," and "Always True To You in My Fashion." Hot, salted Chinese "imitation" egg noodles and tap water were on hand to clear the palate. And there was even a lovely blond in the room: me. The sweet dried pork Martini, despite the lack of apparent surface oil, coated the bottom of my upper lip with a tangy pork greasiness. I was casually impressed, though I began to worry about what the more visibly oily pork vodkas would later offer. 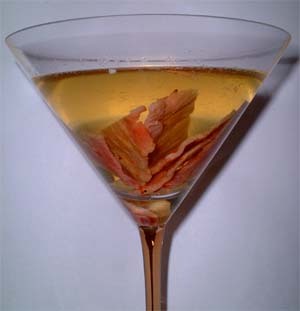 The chilled Martini had a piggy bouquet beyond its plain pork-vodka aroma. Was that the endothermic effect of the chilled liquor alerting the nose, or the action of the herb-steeped vermouth? I sipped a little. No aftertaste or aftereffect beyond the expected tummy warmth. Little flavor at all, in fact. Dried meats would seem less than optimum. The ground pork Martini's scent was powerful with essence of pork patty. This is not a cocktail for the pork Martini dilettante: Like specifically demanding from your bartender a "vodka Martini" instead of the understood default gin Martini, you'll have to specify the "pork patty Martini" instead of a vanilla version, and make sure he or she fries the pork just right, searing the surfaces, draining the fat, and not letting it burn while you chase Naomi or Leonardo into a restroom. Come back when it's mixed. Wow. This Martini packed a pork wallop. The aroma was overpowering, I have to admit. But that masked the oil; I saw the oil before, really, see my comments under "Transmogrification," supra, but I tasted no oil. I declaim this a Martini you will love or hate, no middle ground. You could get drunk on the bouquet alone, a secondary high. Your neighbor will notice -- and I mean your next-door neighbor, as you mix this at home, not the crackhead on the next barstool -- and ask "Hey, is that pork you're drinking?" "Yes!" you trumpet proudly. A great way to make new friends. Unless he or she is a vegetarian. But who wants a vegetarian friend? Here comes the sausage! Forgive me: I accidentally doubled the vermouth. The yellow cast was gone. But it was as distinctively sausagey in odor as the ground pork was groundy. The cheesecloth let lots of pork particulate through: This was a cloudy one, people, best served in the dark. Lots of fat on top, another downer. But the taste was crisp, and it had an aftertaste. Further pork Martini experiments must play with the full sequence of flavors to restore the crisp Martini bite to the previous two drinks. The seeds -- dill? -- aren't even masked by the extra vermouth. 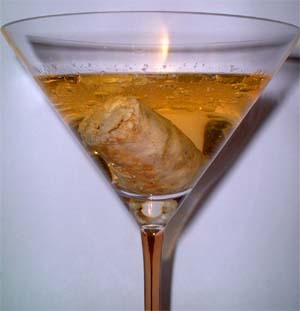 The pork sausage Martini was a winner, more generic than the ground pork Martini, but as strong and fine. Look for it at a street-fair truck near you, with a green-pepper garnish. Spam time. N.B. : I don't like Spam. I hate it. I can't believe that Spam is so hip nowadays. Have its apologists actually tasted it? Canned cat food is strip steak next to the foul, pink, greasy, Dachau-invented excrescence that is Spam. Spam tastes sour. It has no texture. It overpowers any attempts at seasoning. But here it is. 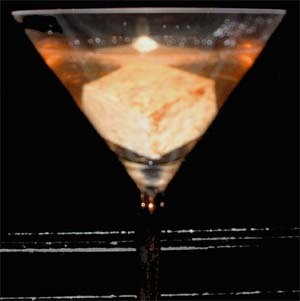 If the Spam Martini holds its own within the esthetic parameters of Spam, my staring at that pickled-fetal-tissue imitation for two weeks will have been worth it. I admit that the bouquet is odd, neither of Spam nor of gelatin, not that it could be the latter since I'd washed that off. The sausage particulates had been chunky, but the Spam fragments are uniformly tiny and stay suspended in the cocktail like Orbitz Gummi spheres. Shake the strained Spam Martini lightly and they all move in unison. This is more than oxygen depletion. I am convinced that the Spam has changed the specific gravity of the vodka. But I don't have the equipment to test that. Oh, wait. I have to taste this, don't I. Hm. Hm. I don't want to do this. I'm holding my nose. Here goes. I can't believe I made a Spam Martini. Good-bye, Wendy, I love you. Huh. Hey. I lived! God. It's salty. You can't taste the ham. You can't even taste Spam. It's pure salt. Not tingly Margarita rim-encrusting salt, but oily, slimy salt. I am majorly clearing my palate here. Little noodles all over the place. Sipping water. Once again. Faugh. Pbbbbbft. Bleah. I am pouring the water into the drink. Tasting. Whimper. Forget it. This is a loser, people. Spam doth not a Martini make. Word to your bartender. Back to home page for more tipsy writing.